Stewart McDannold Stuart hosts www.sms.bc.ca to provide a resource for information on matters that might be of interest to current or potential clients* of Stewart McDannold Stuart. Use of this website is subject to the following terms and conditions which may be updated from time-to-time without notice. Your use of the website constitutes your agreement to be bound by these terms. *See the list under restricted clientele below to see if you qualify as a client of Stewart McDannold Stuart. The materials provided on this site constitute general information relating to areas of law familiar to our firm lawyers. The information on www.sms.bc.ca is not intended to provide or replace legal advice. The facts of your case are important and may affect how the law applies. Therefore, general statements of law and comments made in materials on this website or information accessed through links on this website to other legal resources are not a substitute for getting specific legal advice from a lawyer qualified to practice in the jurisdiction where you are located. Although the use of the website may facilitate communications with the lawyers at Stewart McDannold Stuart by e-mail or voicemail, receipt of any such communications or transmissions alone does not create a solicitor-client relationship, unless Stewart McDannold Stuart agrees to represent you. Stewart McDannold Stuart restricts its clientele to municipalities, regional districts, health authorities, provincial government ministries, crown corporations, similar government bodies and related professional organizations. We do not advise nor will we represent individuals, ratepayer associations, land developers and other non-government persons or bodies. Unless you have made prior arrangements with us please do not leave voice mails or send email to the lawyers at Stewart McDannold Stuart through this website that contain specific or confidential information about your legal affairs. Such voice mail and email is not confidential, does not create a solicitor-client relationship and may not receive a response. Colin Stewart, Robert Macquisten, Kathryn Stuart, and Peter Johnson, the partners of Stewart McDannold Stuart, provide legal services through law corporations with the assistance of associate lawyers in the firm and, with respect to www.sms.bc.ca, will have no liability for any damage arising from the misuse of any information provided on this website. The information provided on the website is not intended to be legal advice and should not be relied upon as such. Doing so without seeking the advice of legal counsel constitutes a misuse of the information. You are cautioned to consult a lawyer before you rely on or use the legal information obtained from any website. 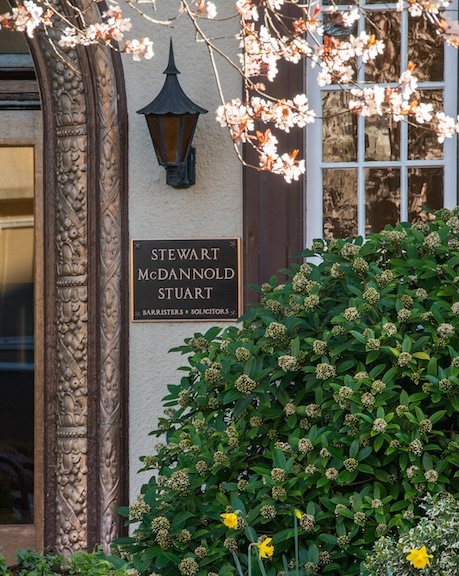 References to successful case results where the lawyers at Stewart McDannold Stuart have acted for clients are not a guarantee of future results. The outcome of every legal proceeding will vary according to the facts in each individual case. Due to ongoing legislative changes and developments in case law, information on this website may be date sensitive. Although Stewart McDannold Stuart makes reasonable efforts to present and maintain current and accurate information on this website, we do not guarantee or warrant its currency, completeness or accuracy, or the currency or accuracy of information contained on sites to which this website links. The website and the materials provided on the website are provided “as is” and “as available” without representations, warranties or conditions of any kind, either expressed or implied. The www.sms.bc.ca website has been designed to be a resource for information on matters that might be of interest to current or potential clients* of Stewart McDannold Stuart. As a result, there may be links on www.sms.bc.ca to third party sites. These links are provided for convenience only, and do not mean that Stewart McDannold Stuart endorses or recommends the information contained in linked websites, or guarantees its accuracy, timeliness or fitness for a particular purpose. Stewart McDannold Stuart takes no responsibility for the content or practices of third party sites.